Admit it: You thought we were gonna say Solti or von Karajan, right? Girls, girls, tuck your brass knuckles back into your Prada -- you're all pretty. To celebrate Richard Wagner's May 22 bicentennial, Corriere della Sera ran two pieces tied into the current La Scala Ring Cycle, conducted (naturally) by MD Barenboim through June. 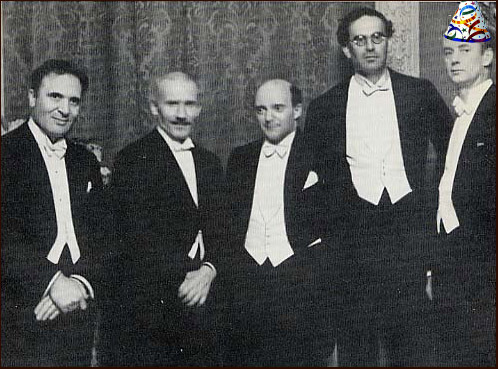 The ten conductors of the Scala Ring Cycle Clubhouse are a Mötley Crüe: Barenboim, Ettore Panizza, Riccardo Muti, Arturo Toscanini, Siegfried Wagner, Clemens Krauss, Franz von Hoesslin, Andre Cluytens, Wolfgang Sawallisch and Wilhelm 'Fuffi' Furtwängler, whose 1950 live appointment is available on a special Corriere 2-CD set to honor Wagner's 200th birthday. "He understood that in the Wagner Ring Cycle, the music 'isn't' but rather, it 'becomes'". The second piece delves into Furtwängler's myth. In the beginning was the Word, and the Word was with Gawd and the Word was Gawd, if only here, Furtwängler's gawds were his father's august dinner guests, the great icons of German Idealism. A life mired in controversy over his ambiguous relationship with Nazism, the choice to remain in Germany after 1933 while his colleagues fled and his crafty subversion of the Third Reich, his protection of Jewish musicians and later, the icons who defended his reputation: Menuhin and Schoenberg, Barneboim and Gergiev. "The question of interpretation is, at the same time, complex and simple, just like in all cases where love plays a fundamental role. Making music -- as a composer, an interpreter or a performer -- is above all an act of love." To spread the love, here's our favorite Richard Wagner tributes from the webs: Sinfini Music, Alex Ross for The New Yorker and BBC Radio 3. Since 1999, Milan's young, roguish la Verdi orchestra, based in bohemian neighborhood Navigli's Auditorium di Milano, has been singing its bloated-from-Xmas a$$ off with Beethoven's fetish-inducing Ninth symphony. What better message to megaphone into the New Year than Schiller's Ode An Die Freude poem of unity and brotherhood? Really, a perfectly-formed narrative before the final O Freunde kiss of death. To bow 2013, la Verdi's MD Zhang Xian gave us a-buck-twenty-five of sterling tempi, grave tension and four great soloists, including another American girl living in Milan, soprano Laura Aikin, and Austrian bass Thomas Tatzl who probably declines invitations from Abercrombie's street team recruiters every time he treads the pavement. Yeah, we crushing. Haters fly away. Read more next week when OC reviews the performance officially for her Grazia.it column -- and in case you missed it, here's her La prima della Scala Wagner Lohengrin. OC's rhapsodizes endlessly on Wilhelm Furtwängler's ethereal August 22, 1954 Lucerne Beethoven's Ninth with the Philharmonia and Schwarzkopf, Cavelti, Häfliger and Edelmann for good reason -- it's a chillingly sober reconciliation of a man who understood he was living on borrowed time and was grappling with his own mortality ("This time I had one foot in the other world," he had told his wife) -- so we've cued it up on the 'tubes -- all Gioia-scintilla-divina-e-bella-nata-nell'aura-elisia of it. Enjoy Brothers! If you ever wanted to know what was on Daniel Barenboim's iPod, here you go! The Argentinian/Israeli maestro, like us, has a thing for Big Willy Furtwängler. Däniel Bärenboim's Furtwängler fetish! Herr Doktor "Big Willy" Furtwaengler and Opera Chic wish the readers a happy Easter bunny day. Earlier today, Maria Furtwängler, the dirndl'd step-granddaughter of Wilhelm, chugged beer and munched on wurstel beneath the Hippodrom at Munich's 175th Oktoberfest. Go guuurl get yo' kartoffelknödel on! Alles Gute zum Geburtstag, Wilhelm Furtwängler! Today would have been the 121st birthday of Wilhelm Furtwängler (if he had been born a superman or robot that lived forever). The German conductor, born January 25, 1886, was memorable for his spastic puppet-like idiosyncrasies on the podium, but even more memorable for his sublime symphony recordings along with a rare smattering of opera. Favorite Furtwängler recordings in the Opera Chic household? 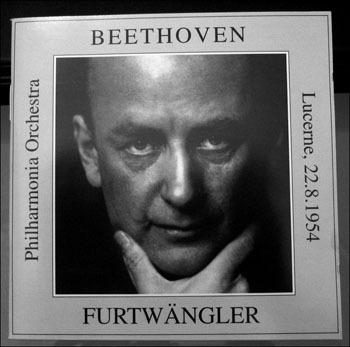 The 1954 Vienna Don Giovanni with Schwarzkopf, and all of his Beethoven Ninth recordings, especially his ethereal Ninth of the Philharmonia Lucerne Festival recording from August 22, 1954. 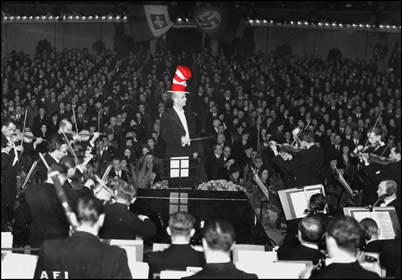 Fun fact: In some circles of Milanese music critics, Furtwängler (in the party hat) affectionately goes by the sobriquet "Foofie".